This tour allows you to explore the best that Victoria Falls, Zimbabwe and Chobe National Park, Botswana has to offer. Each an icon in its own right, the tour gives you a complete experience with a dinner cruise on the mighty Zambezi River, an elephant back safari or walking with lions or a scenic helicopter flight of angels over the Falls! In Botswana you explore the Chobe River on game viewing boat cruises and the Park on open vehicle game drives. On arrival at the Victoria Falls airport, your guide will meet you and transfer you to The Kingdom Hotel where you can check in and relax till it is time to depart on your Dinner Cruise on the Zambezi River! Note that these may be other guests joining you in the transfer vehicles and on the cruise. Accommodation upgrades and private transfers are available at an additional charge. Today is filled with one of the 7 Wonders of the World! The schedule of the day is subject to your choice of activity and availability. The day is rounded off with a night of African Entertainment at The Boma Restaurant. A buffet offering a huge variety is complimented with interactive drumming and tribal dancing! Zimbabwe park fees are included in the price as a local payment. Park fees remain subject to change as legislated by government. You may opt to pre-pay this when booking your tour – please speak to your consultant). After a relaxed breakfast, you check out and will be transferred to the Kazungula border post to enter Botswana. This transfer takes around 1 hour. On arrival in Kasane, you can check into your room and enjoy an own expense lunch at the lodge on the banks of the Chobe River before joining the afternoon game viewing boat cruise. The area is renowned for its huge elephant population, but a cruise also allow you to see many of the numerous bird species that occur here, as well as a myriad of animals coming down to the river to drink. The river is of course also home to animals such as hippo and crocodile. A buffet dinner is served at the lodge in the evening (included). We start the day with an open vehicle game drive in the world renowned Chobe National Park! The park is known for its big herds of animals, especially elephant. Note that you are more likely to see the bigger herds in winter, but game viewing year-round is always good. 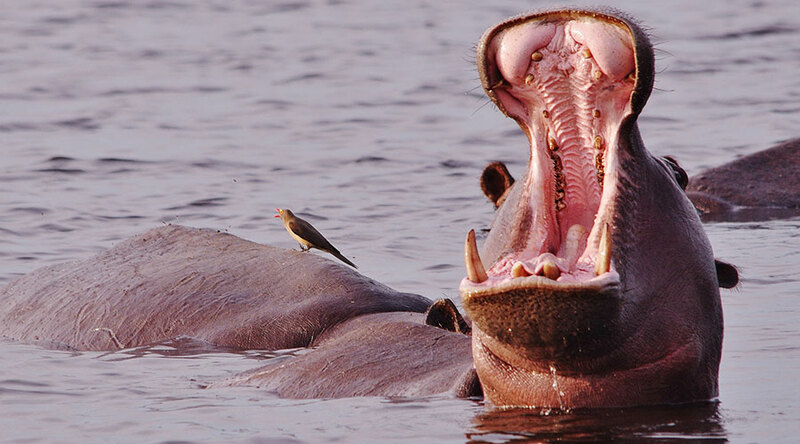 In the afternoon you explore the Chobe River on one last boat cruise. Breakfast & dinner is included. To allow for different departure points and onward tours, we have not included any activities this morning. Please speak to your consultant should you wish to add any optional excursions or overnight extensions into the Moremi, Savuti or Okavango Delta. After breakfast & check-out, you will be transferred to either Victoria Falls or Kasane airports for your onward flight or tour.